Here’s a green idea that relates to the sustainability of our Earth’s resources and to the added comfort of our human existence. Bed sheets made from the fibers of eucalyptus trees. Over the past couple of years, we had seen bed sheets made from plant fibers other than cotton offered for sale at the local Bed, Bath, & Beyond. Bamboo sheets were the first to catch our eye. But by the time we made up our minds to give them a try, the bamboo sheets had been replaced by eucalyptus. No problem--we bought a set of these to try out. They’re great and very comfortable to sleep on! According to our reading and research, the fibers that are used in the sheets come from a cellulose that is derived from eucalyptus by means of an organic solvent. The solvent is non-toxic and can be recaptured and reused in the manufacturing process. The remaining emissions are broken down in biological water treatment plants. Also of great environmental value is the fact that 100 times less water is required in the manufacture of eucalyptus bed sheets than is required in the manufacture of traditional cotton bed sheets! And, whereas cotton has to be farmed (generally with the use of chemical fertilizers and pesticides), the fibers of eucalyptus come from trees grown in a sustainable and renewable manner--that is to say that at harvest time only the parts of the trees above the ground are cut off. The tree roots are left in the soil, and the tree re-grows to a harvestable size again in less than 10 years! Because of the antibacterial and antimicrobial qualities of eucalyptus, which has been shown to kill dust mites and to kill or deter bed bugs, sheets made from eucalyptus fibers have been greatly embraced and widely utilized in the hospitality industry. From the point of view of the average consumer (like us), the sheets are just plain comfortable. If the proper care instructions are followed (machine wash cold, gentle cycle, only non-chlorine bleach if needed, tumble dry low), the sheets do not pill or lose their almost satiny-smooth feel and texture even after much use and many washings. 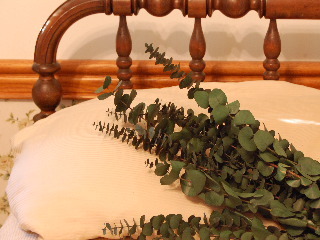 The eucalyptus bed sheets resist color fading and shrinkage. They also have a “moisture control” texture that keeps you cool and comfortable even in warm weather.